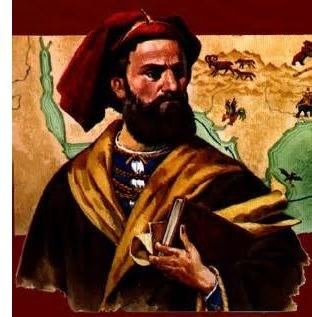 Marco Polo (ca.1254-1324) - Two hundred years before Christopher Columbus sailed West in an attempt to reach the Orient, Venetian merchant, Marco Polo, traveled East along the Silk Road and made it all the way to China. He was born into a family of merchants in 1254, but never met his father until he was 15 years old. That's because his father and uncle, Niccolò and Maffeo, had established lucrative trading outposts from Constantinople all the way into the Mongol Empire. They left Venice the same year Marco was born and moved to Constantinople where they lived for several years. Recall that at the end of the Fourth Crusade, the Crusader army, working on behalf of Venice, captured Byzantine capital and established the Latin Empire. Many Venetians moved to the city and a Venetian district sprang up within its borders. However, in 1261, the Greeks retook the city, re-established the Byzantine Empire and destroyed the Venetian district. Fortunately for Niccolò and Maffeo, they saw the political change coming and left Constantinople in 1260. They moved east to Sogdia on the Crimean Peninsula, which was on the western edge of the Mongol Empire. Eventually business drew them into the heart of the Golden Hoard and they settled in the city of Sarai. In 1264 the two brothers joined a diplomatic envoy sent by Hulagu Khan to the Chinese city of Dadu (present-day Beijing) which was ruled by his brother, Kublai Khan. They arrived in 1266 and were welcomed by the emperor. In 1269 he sent them back to Venice with a request for the Pope to send missionaries to teach the Chinese about Christianity and Western culture. It was at this time that Niccolò finally met his son, Marco. In the meantime, Marco's mother had died and he had been raised by an aunt and uncle. So Niccolò took Marco with him on his return trip to China. They left in 1271 and did not return until 1295, 24 years later. Much of that time Marco, his father and uncle served in the court of Kublai Khan. When Marco and his uncle returned (Marco's father died in 1294), they found their city at war with Genoa. As a result, Marco was captured by the Genoans and imprisoned. The story of Marco Polo's fantastic travels might never have become known to the world save for the fact that, while in prison, he met Rustichello da Pisa and related his journeys to him. Rustichello, a writer by trade, copied them down, and his work was published when the war between the two city-states ended, and both men were released from prison. The Livres des merveilles du monde (Book of the Marvels of the World in French, commonly called The Travels of Marco Polo in English) and became a best seller in Europe. The book was said to have been a motivation for Christopher Columbus' voyage two centuries later. Because Marco is the one who dictated the events to Rustichello, it is he who is remembered by history. But in truth, his father and uncle deserve at least as much credit for this early tie between East and West.